On 3rd February 2015, Embraer successfully performed the first flight of the new Military Transport and Aerial Refueling Jet, the KC-390. Test pilots Mozart Louzada and Marcos Salgado de Oliveira Lima and flight test engineers Raphael Lima and Roberto Becker flew the aircraft for 1 hour and 25 minutes, conducting an evaluation of flying qualities and performance. “This first flight is a fundamental step toward accomplishing the task with which we were entrusted. The KC-390 is the result of a close cooperation with the Brazilian Air Force and international partners, representing what is most likely the greatest technological challenge that the company has ever encountered in its history. We are profoundly moved for having achieved this key milestone”, said Frederico Fleury Curado, President and CEO of Embraer. 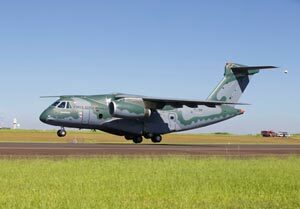 “The KC-390 will be the backbone of Transport Aviation for the Brazilian Air Force. From the Amazon to Antarctica, the fleet of 28 aircraft will play a key role in the diversity of projects of the Brazilian State, from Scientific Research to the maintenance of sovereignty”, said Aeronautics Commander, Lieutenant-Brigadier General Nivaldo Luiz Rossato. On May 20th, 2014, Embraer and the Brazilian Air Force signed the Serial Production Contract for the delivery of 28 KC-390 aircraft and Initial Logistic Support. Besides the order from the Brazilian Air Force, there are current purchase intentions from other countries, for a total of 32 additional aircraft. Embraer S.A. is the world’s largest manufacturer of Commercial Jets up to 130 seats, and one of Brazil’s leading exporters. Embraer’s headquarters are located in São José dos Campos, São Paulo, and it has offices, industrial operations and customer service facilities in Brazil, China, France, Portugal, Singapore, and the U.S. Founded in 1969, Embraer designs, develops, manufactures and sells aircraft and systems for the Commercial Aviation, Executive Aviation, and Defence and Security segments. It also provides after sales support and services to customers worldwide.